Glowy: Naomi Campbell In Nike x Riccardo Tisci Air Force 1 sneaker boots. Naomi Campbell In Nike x Riccardo Tisci Air Force 1 sneaker boots. Naomi Campbell was spotted out and about in on Wednesday evening 28 January in Paris, France after walking the runway at the Jean Paul Gaultier spring/summer 2015 fashion presentation held during Paris Fashion Week Haute Couture Spring/Summer 2015. She wore a black and blue fur coat on a turtle necked top and a velvet sweat pants. 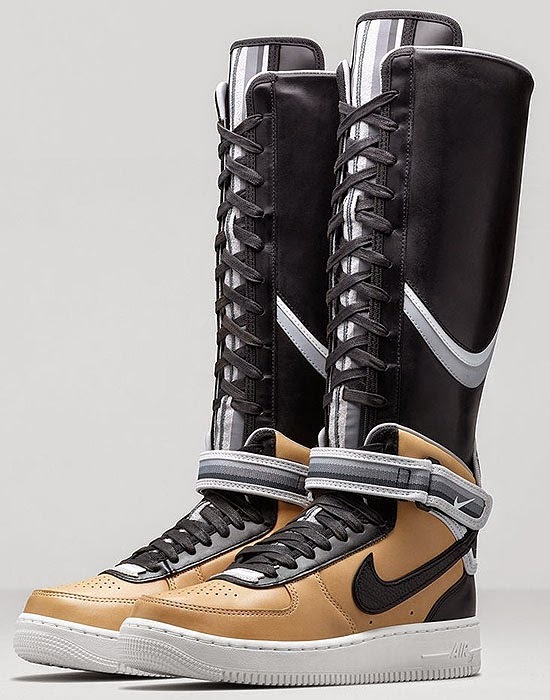 she then finished up her look with a Nike x Riccardo Tisci Air Force 1 sneaker boots. Now lets analyse her entire look..
Naomi is really a beautiful woman who can give any young girl out there a run for their money but her outfit was a no no for me...alright lemme expatiate further...her fur coat didn't really go in line with her sweat pants maybe she was really tired after walking the run way that she quickly had to put on the closest thing she saw...like i said maybe..you can see that her laces and velcro straps on her sneaker boots were not even tied thereby giving her a laid back look. You can also see she's wearing a purple flower...to me it's looking somehow abeg...maybe she loved the purple flower brooch that was used in styling her for the Jean Paul Gaultier spring/summer 2015 fashion presentation that she had to wear it out and even stuff some into her handbag...well we can only talk and pass comments but the fact remains that it's her body. corrections....never wear sweatpants with knee boots..gosh it gives one the look of been a gardener or something related..even if you really wanna wear a sweatpants,you can pair up with a normal sneakers or better still a pumps. Her sneakers also comes in white and black color too. Check out Wale in same sneakers but not knee length..
Maybe tomorrow, i will do a topic on how to wear knee length sneakers..